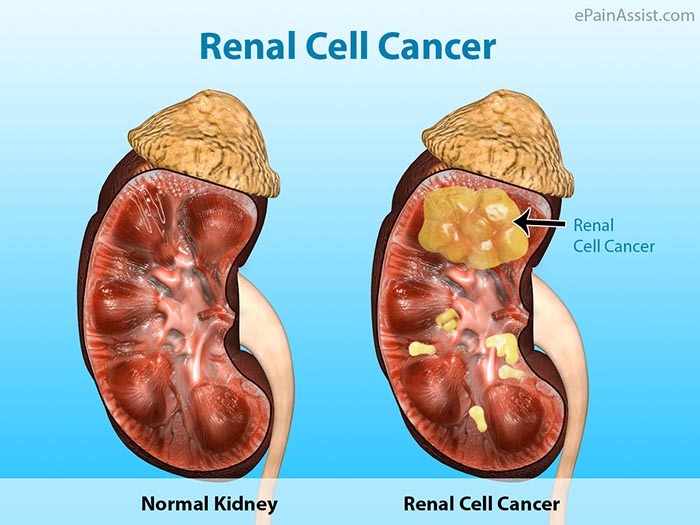 Kidney cancer or renal cell carcinoma cancer usually occurs in older people and accounts for about 2 to 3% of cancers in adults, affecting about twice as many men and women. 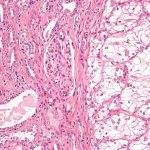 This tumor begins in the cells, which is in the lining of the small tubes within the kidneys. Kidney carcinomas rarely strike young adults as well as children. The exceptions are a form of pediatric cancer called Wilms’ tumor, and some forms of hereditary kidney tumors, such as Von Hippel-Lindau disease. The causes are not known, however, external factors, such as smoking and obesity have been associated with the increase in renal cell carcinoma. Changing environmental factors, as well as the aging population has been in correlation with the increase of this form of cancer. Kidney cancer symptoms are often overlooked because tumors usually grow slowly and isn’t suspected until the patient begins to experience symptoms such as blood in urine, pain, tiredness, and a palpable mass. Since back pain is common among people over 40 years of age, such pain is often ignored and the presence of cancer might go undetected. This type of cancer may also cause high blood pressure. The risk of getting kidney cancer is four times higher if a close relative has had the disease. Being on dialysis for many years is also a risk factor when it comes to kidney cancer. People who have had bladder cancer are more likely to develop kidney cancer. About 3% of kidney cancer patients have inherited a damaged gene that will make it likely for the cancer to also form in their second kidney. Not smoking is the most effective way to prevent kidney cancer. It’s estimated that the elimination of smoking would reduce the rate of renal pelvis cancer by one-half and the rate of renal cell carcinoma by one-third. Other factors that may decrease the risk of kidney tumors include maintaining a normal body weight, a diet that is high in fruits and vegetables, especially in bananas and root vegetables such as carrots, maintaining normal blood pressure, and limited exposure to environmental toxins. Cancer of the kidney is most commonly detected with computed tomography (CT) scan, ultrasound, or magnetic resonance imaging (MRI). Cystoscopy can rule out associated bladder cancer. Kidney cancer cells may also break away from the original tumor and spread (or metastasize) to other parts in the body such as the lymph nodes, bones or lungs, with about one-third of cases showing metastasis at that time of diagnosis. Almost 85% of this tumor is said to be renal cell carcinomas. A less common type of kidney cancer is papillary carcinoma. Other rare kidney cancers include renal sarcoma, collecting duct carcinoma, medullary, and chromophobe carcinomas. Radical nephrectomy with or without the removal of lymph nodes offers the only cure but treatment of kidney malignancies may include surgery, arterial embolization, radiation therapy, biological therapy, or chemotherapy – depending upon the time of the disease and the patient’s overall health. Nephrectomy or removal of the entire organ including the adrenal gland, adjacent lymph nodes, and surrounding normal tissue has been the norm, but recent research shows that removal of just the tumor produces similar survival rates and offers less chance of subsequent renal failure in selected cases. Scientists are also now able to isolate the gene responsible for VHL disease. This discovery offers exciting future possibilities for improved diagnosis as well as treatment of some kidney tumors. Various combinations of interleukin-2, interferon, and other biologic agents and even vaccines developed from cells removed from the kidney cancer are also being investigated. With prompt and appropriate treatment, the renal carcinoma cancer mortality rate is fairly low. Unfortunately, this type of cancer has a tendency to spread early, especially to the lungs, sometimes before the symptoms even start to show. The five-year survival rate is said to be around 90-95% for tumors less than 4 cm. For bigger tumors limited to the kidney without venous attack, survival is still generally great at 80-85%. In the event that it has metastasized to the lymph hubs, the 5-year survival is around 5 % to 15 %. In the event that it has spread metastatically to different organs, the 5-year survival rate is under 5 %. An important factor for those with this form of cancer and for that matter with all cancers is that assertive patients who actively work to overcome cancer often increase the odds of survival, live longer, and enjoy life more.